Johannesburg, South Africa. 45 Pesticide Registrars and Designated National Authorities of the Rotterdam Convention from the 15 Southern African Development Community (SADC) countries discussed the risk of Highly Hazardous Pesticides (HHPs) to human health and the environment, their management and the implementation of the Rotterdam Convention at large during a 5 day workshop. The workshop also followed up on the SAPReF Strategic Action plan agreed at a similar workshop in Harare, Zimbabwe at the end of July in 2015, identifying risk reduction from HHP and implementation of the Rotterdam Convention as high priorities. 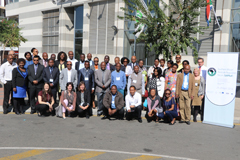 The Southern African Pesticide Regulators’ Forum (SAPReF) was formed in 2011 and since then placed particular attention on fostering regional collaboration for sound pesticide management. Key institutions namely FAO, University of Cape Town, Swedish Chemical Agency and the SADC Secretariat support this forum since the beginning. Through regional collaboration, countries are enabled to work more closely, share resources, lower the costs of pesticide registration, and coordinate implementation of the Multilateral Environmental Agreement such as Basel, Stockholm and Rotterdam Convention. Participants were trained on identification of potential HHPs using their national registers of pesticides, risk management and on the protocols for the field surveys to assess use conditions of HHPs. “The Pesticide Registration Toolkit developed by FAO facilitates this important task that has to be carried out by countries”, Nadia Correale from FAO’s Plant Production and Protection Division says. The workshop put also emphasis on identifying gaps and challenges faced by the 15 countries (13 are party to the Rotterdam Convention) in meeting particular obligations under the Convention, such as preparation and submission of notifications of Final Regulatory Actions (FRA) under Article 5 and taking advantage of the opportunity in preparing and submitting proposals for Severely Hazardous Pesticide Formulations (SHPF) under Article 6. Christine Fuell, the Coordinator of the FAO part of the Rotterdam Convention Secretariat stressed that “FAO, the Rotterdam Convention Secretariat, WHO, KEMI and UCT will continue to provide support to the SADC Member Countries in finalizing their national action plans and take any further steps to reduce the risks posed by highly hazardous pesticides (HHPs)”. For more information, please contact Nadia Correale at nadia.correale@fao.org.